Would you like to study in the Czech Republic? The Czech educational system is considered to be one of the best in the world according to the Programme for International Student Assessment (PISA). In addition, Czech higher education institutions offer a wide variety of study programs taught in English and other foreign languages specifically designed for international students. In fact, over 30000 international students chose to study in the Czech Republic in 2009, whether as part of an exchange program or as free movers. If you decide to study in the Czech Republic, you will not only benefit from its perfect location in central Europe, but also from its membership to the European Union and the Schengen Area. You may enjoy visiting other parts of beautiful Europe without the need of visas while earning a degree. Welcome to study in the Czech Republic! Often described as one of the most beautiful and interesting cities in Europe, Pragueis the largest city in the Czech Republic and home to 1.2 million residents. Situated on the Vltava River, Pragueis a city of classical beauty with stunning views that extends from the banks of the river to the surrounding hills.Prague's magical atmosphere has been shaped over ten centuries. As you walk the narrow lanes and cobblestone streets you experience a city saturated with history, architecture and culture. Prague is an unbelievably free and comfortable city. Despite not being as big as most European cities it has an excellent network of trams and metros (underground) that makes it very easy to travel to A campus from most locations using public transportation or walking. Main attractions, cultural sites, sporting events, clubs, and cafes are within easy reach. Pragueis home to three major public universities, including Charles University established in the 13th century,Czech Technical University and the University of Economics. 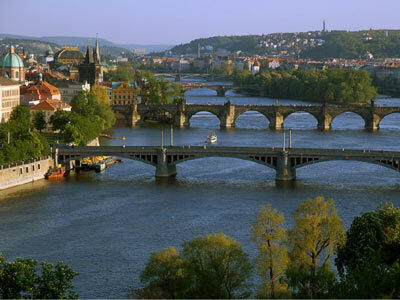 Pragueis also a favorite destination for many international exchange students. It is definitely a city where young adult students are welcome and can socialize easily. The Czech Republic can best be described as an evolving country with a glorious, but sometimes turbulent and tragic past. As a new member state of the European Union, the Czech Republich as made many strides forward since the Velvet Revolution in 1989. Like Prague, the provinces of Bohemia and Moraviaprovide many opportunities for students to explore and experience. There are over 3000 castles, palaces, historic monuments, and preserved medieval towns throughout the country. Moreover, nature lovers can enjoy a host of national parks and protected nature reserves with superb scenery while sports enthusiasts can find many locations for hiking, climbing, skiing and snowboarding. Czech Republic has a moderate continental climate with four distinctive seasons. The average temperature in the winter (December to March) is about-5°C (23°F) and in the summer (June to September) is about 20°C (68°F). Generally speaking,Prague is an affordable place to live compared with other European cities.